I enjoyed Whiskey and Moonshine, a Dreamspun Desires title by Elizabeth Noble as I do most of her romances. She created two wonderful main characters in Colton Hale and Mal Kensington, as well as including a age difference/economic level advantage to make it interesting. On top of that? The basis and foundation of Whiskey and Moonshine is a famous family held whiskey/moonshine distillery along the line of Jack Daniels so the reader gets some fascinating inside details on how whiskey is cured and stored. I really could have used a little more of that. But what we get is enough to provide an authentic “flavor” and framework for Mal and the Kensington Distillery. I actually found the novel the strongest when it had Colton working in the janitorial department and scanning the company boards for jobs to work his way up in a company and place he was clearly meant to be. Touching, real, and given his background, easy to connect with his struggles to move forward. And delight in a company that continued to accept him. When the company chooses Colton to be the ‘face” of the distillery, then the novel moves into several new stages. The romance stage and changes in dynamics for many of the relationships here, including Colton and Mal. We lose that intimate connection Colton was having with the distillery oddly enough as he becomes it’s spokesperson and it removes him from the actual jobs itself. Colton keeps saying he wants to learn the business but that’s impossible when your job is public relations and “the road”. That’s one hole that never gets completely filled in this story. The warm, loving relationship between Mal and Colton is lovely and sweetly based on complete truths on Colton’s background. A nice changeup from other novels. But it’s also a bit of a reality bump for me in the story. I didn’t have issues with their relationship, not the age difference or anything else for that matter. Mine was more of a corporate common sense one. Colton had lived on the streets for years, turning tricks and doing what he had to survive. He told Mal and the people who hired him. Admirable and truthful. Hire him for lots of things. But not the very public “face” of Kensington Distillery who appears on The Tonight Show for all his former johns to see. I really don’t see that happening in RL, nor that he didn’t have even one charge for soliciting after all those years on the streets in Toledo for someone to find. So that all that strike me as realistic? Uh, no, not really. That strikes me as a public relations nightmare. Does it come up? No. Other things yes, this huge one no. So there are things here you either just pretend to overlook or they don’t matter to begin with, because you are enjoying the romance so. And that’s ok, it’s a really sweet romance with some angst and drama in the wings. It all gets sorted out in time for a HEA in the Smokies. If you like contemporary romance, Elizabeth Noble, and the Dreamspun Desires line, then Whiskey and Moonshine is another story you will want to grab up. Cover Artist: Alexandria Corza has done a fine job with the cover and story elements. Great job. This entry was posted in Book Reviews, Books, Contemporary fiction, Dreamspinner Press, eBooks, LGBTQ Book Reviews, M/M Book Reviews, M/M Contemporary Fiction, M/M Fiction, M/M Romance and tagged A Dreamspun Desires title from Dreamspinner Press, A MelanieM Release Day Review: Whiskey and Moonshine by Elizabeth Noble, age difference in couple, Author Elizabeth Noble, Whiskey and Moonshine by Elizabeth Noble. 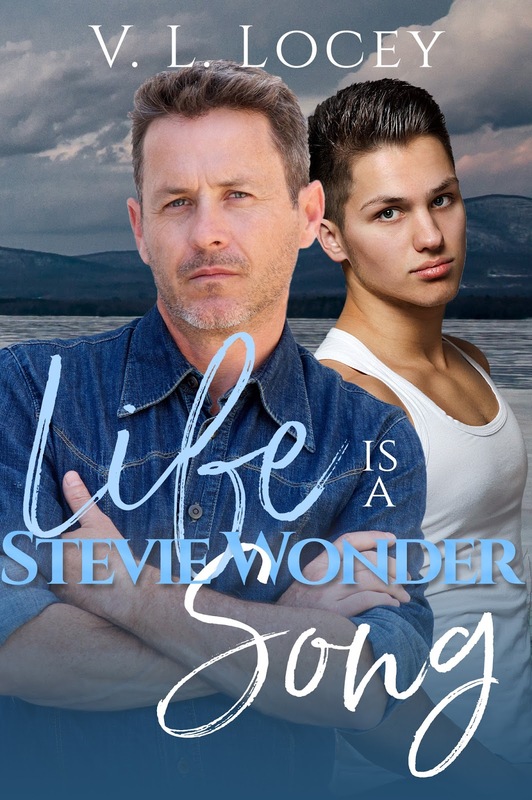 This entry was posted in Book Giveaways, Book Reviews, Book Tours and Contests, Books, Contemporary fiction, eBooks, LGBTQ Book Reviews, M/M Book Reviews, M/M Contemporary Fiction, M/M Fiction, M/M Romance, Uncategorized and tagged @CharityParkerso #newbookrelease #SugarFighter #giveaway, age difference in couple, author Charity Parkerson, Signal Boost Promotions, Sugar Fighter (Sugar Daddies #1) by Charity Parkerson. This love story between a President’s son who grew up in the White House and the Secret Service agent who was assigned to protect him in the last year of his father’s presidency was interesting, action-packed, and enjoyable, especially given the fact that May-December romance is one of my kinks. I must admit, however, that even though that’s true, in this case the age gap also made me squirm a bit due to the younger man’s age. Shane is twice as old as Rafael Castillo, his protectee, who is nineteen as the story opens. And while I can see Rafa having a crush on Shane, it was more difficult to accept Shane’s crush on Rafa. They spent a lot of time apart, though Rafa watched Shane from a distance and speculated on what it would be like to kiss him, or be held by him, or more. But the two didn’t spend more than a week or so in one-on-one conversations. Those took place while Rafa’s parents were away and he cooked for Shane in his upstairs kitchenette so they had some private time to talk for a while each night. Even so, their time together was brief. There were plenty of opportunities for superficial interactions between the two and<spoiler> when Shane rescued Rafa from the kidnapping</spoiler> it was obvious they were definitely attracted to one another, but I never felt they were on equal footing. In hindsight, I realize I got emotionally involved with Rafa, but never with Shane, and that might be partly why I didn’t get them as a couple. I also thought that the circumstances surrounding Shane’s and Rafa’s reunion in California after Rafa’s family was out of the White House were unrealistic. Without giving away spoilers, I’ll just say that Shane’s work circumstances and his travel plans seemed unlikely for someone so well established in his career. However, this is fiction and fiction is not fact, and those circumstances were necessary to give the men their HEA and move to the next story in the series. Rafa was a sweetheart, and the story was interesting, at times exciting, and ultimately satisfying. In fact, one of my favorite scenes took place near the end of the story as Shane and Rafa were having fun surfing in California. It was evident they knew each other well, liked each other, and had something special in common. In short, it showed them on equal footing and was the moment when I thought of them as a couple, rather than as two individuals. On that happy note, I can say I’m looking forward to the next book in the series. The cover by Dar Albert depicts a man in a suit wearing sunglasses and holding his left hand to his ear while a younger man looks on in the background. The lower panel also depicts a photo of the White House. This cover cleverly tells the story of Shane, the Secret Service agent who protects Rafa, code name “Valor,” the President’s son. This entry was posted in Book Reviews, Books, Contemporary fiction, eBooks, LGBTQ Book Reviews, M/M Book Reviews, M/M Contemporary Fiction, M/M Fiction, M/M Romance and tagged A Barb the Zany Old Lady Review: Valor On The Move (Valor #1) by Keira Andrews, age difference in couple, author Keira Andrews, Valor On The Move (Valor #1) by Keira Andrews, Valor series by Keira Andrews. 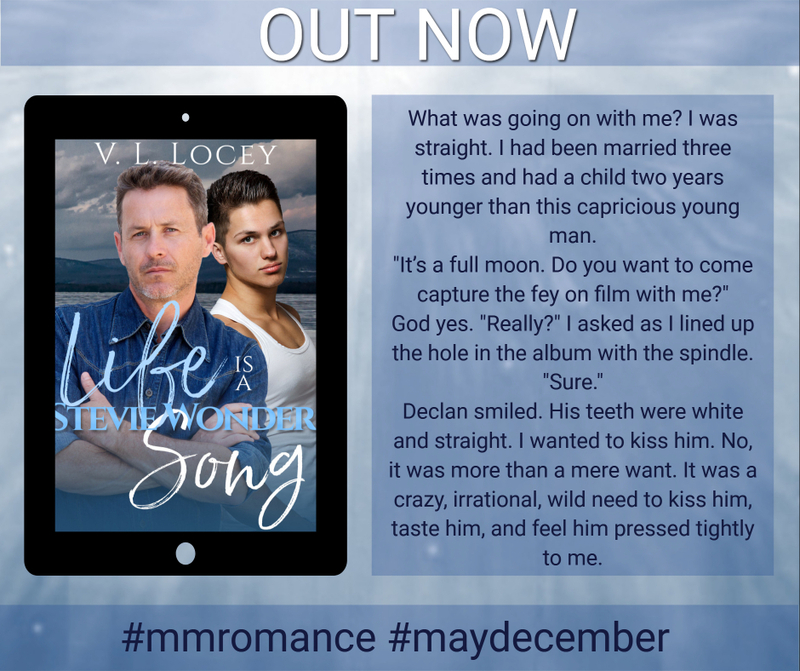 This entry was posted in Book Giveaways, Book Reviews, Book Tours and Contests, Books, Contemporary fiction, eBooks, LGBTQ Book Reviews, M/M Book Reviews, M/M Contemporary Fiction, M/M Fiction, M/M Romance, Uncategorized and tagged @vllocey #newbookrelease #giveaway, age difference in couple, author V. L. Locey, Life is a Stevie Wonder Song by V.L. Locey, may december romance. Jace’s Trial is the first book in the Trials in Abingdon series by a new to me author, JM Wolf. I was very curious about this novel, I read the blurb and found it intriguing and different from the usual plots. So I approached the reading with great enthusiasm. Still, from the beginning it was pretty clear the book wouldn’t have been a success to me. At first I wasn’t understanding quite well why, then I realized the story was going on with an unreality I can’t accept in contemporary romance. Although I read the blurb and so I knew what I was going to read, the first part of the story laid the basis for a disaster. Shortly (and I’m not going to spoiler the book) what happened is Gerard lost his lover, Riley, and one year later he went to Jace’s home (Riley’s son) and the day after they went out for dinner, a dinner more than once called a date, and things soon turned into more intimate as should be between them, The same night Jace asked Gerard if a relationship was possible. Of course I knew a romance would happen between them but not like that. And without revealing too much, yes Gerard said no but he was a liar cause the signal in just that two days were there and Jace got them. The fact the MCs had a sort of “lust at first sight” left me a little dubious. I could accept this from Jace POV but not from Gerard, especially whe the author let me know Jace was the spitting imagine of his father. That led me to believe he wasn’t actually interested in Jace’s person, but in Jace as a substitute of his dead lover. From that moment it was hard to me to find the his character real and believable. Plus the age difference was too evident, although I usually love it, in this case it didn’t work at all, maybe because I saw Jace and his vulnerability as something to protect or maybe because both of them were too hurt to start a relationship. I went on with the reading hoping something would change and made the story more real to my eyes. At the end it was a pain to finish Jace’s Trial, I can assure you I did it just because I had to review it for the blog, otherwise nope. And if you follow my reviews, you know I’m very easy to please, just give me some kind of romance and I’m a happy reader. But when there’s something that bothered me I struggle and it’s impossible to find positive elements to praise. I don’t think I will read the next installment in the series. The cover art by Rue Volley is good, I like the style quite a lot. 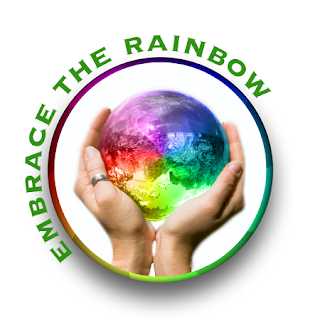 This book contains content of physical and mental abuse, grieving, and bottled emotions. This entry was posted in Book Reviews, Books, Contemporary fiction, eBooks, LGBTQ Book Reviews, M/M Book Reviews, M/M Contemporary Fiction, M/M Fiction, M/M Romance, Uncategorized and tagged A Stella Review, age difference in couple, author J.M Wolf, Jace’s Trial (Trials in Abingdon #1) by J.M. Wolf, physical and mental abuse, Trials in Abingdon series by JM Wolf. This entry was posted in Book Giveaways, Book Reviews, Book Tours and Contests, Books, Contemporary fiction, eBooks, LGBTQ Book Reviews, M/M Book Reviews, M/M Contemporary Fiction, M/M Fiction, M/M Romance, Uncategorized and tagged age difference in couple, author JM Wolf, Jace’s Trial (Trials in Abingdon Book One) by JM Wolf, physical and mental abuse. Mended With Gold is the first book I read by Lee Welch and I have to say it was a lovely surprise. I soon connected with the story and the characters, maybe because the author hit one of my weakness with these kind of souls like Alex and Joe. I love scarred characters, their pain makes them more real, troubled like we all are. I adore couples with an age difference and in some ways here it was evident Alex was more experienced than the younger Joe, but since life had not been easy on both of them, I later found them well matched and truly enjoyed the time I get to learn about their love. Considering this is just a novella, I think the author developed quite well the characters and the plot, I found the setting particular and beautiful, that said to me Mended With Gold ended with a HFN and I would love to meet Alex and Joe again in a new book, and see them how they gained their HEA. I feel to recommend this story and I will definitely look for other works by the author. The cover art by Melody Pond is lovely, clean and fitting. I like it. 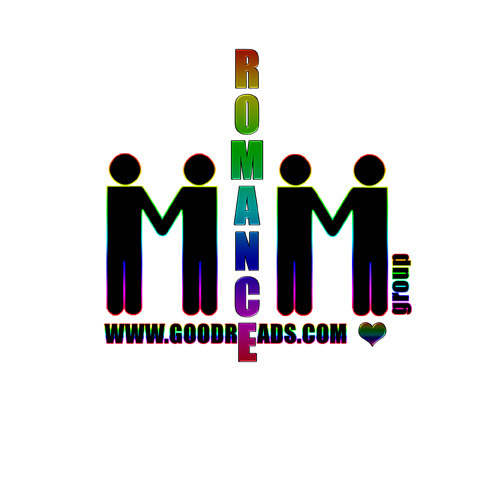 This entry was posted in Book Reviews, Books, Contemporary fiction, eBooks, LGBTQ Book Reviews, M/M Book Reviews, M/M Contemporary Fiction, M/M Fiction, M/M Romance, MLR Press, Uncategorized and tagged A Stella Recommended Novel, A Stella Review: Mended With Gold by Lee Welch, age difference in couple, author Lee Welch, character with PTSD, Mended With Gold by Lee Welch.